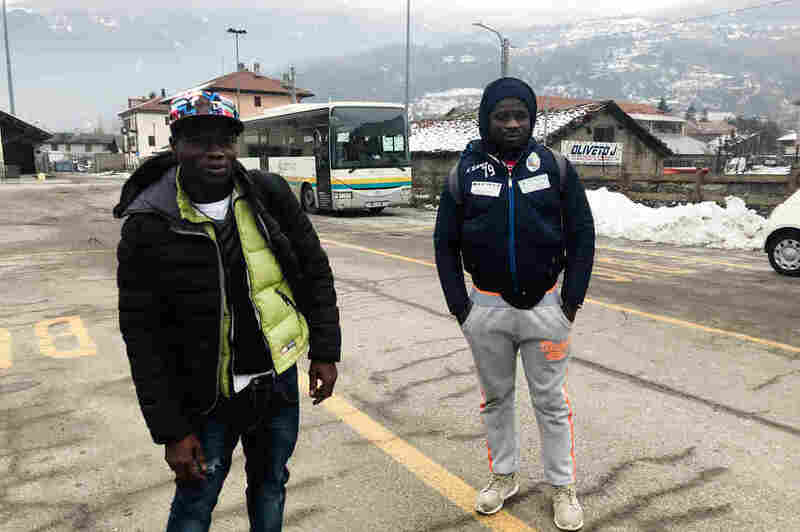 Rejected By Italy, Thousands Of Migrants From Africa Risk The Alps To Reach France This year alone, some 5,000 migrants have attempted to cross from northern Italy into France, according to local municipalities and aid groups. Some have perished along the way. Many are sent back. Migrants walk toward a snow-covered pass to cross the border from Italy to France, in January 2018 near Bardonecchia, Italian Alps. At a ski resort in northern Italy's Susa Valley, outside Turin, children scoot their way onto the bunny slopes as others make snow angels. But deeper in these woods, not far from the border with France, a dangerous and sometimes deadly scene unfolds. Just after midnight, Red Cross workers pick up a 28-year-old man, an African migrant. His pulse is weak and his breathing is shallow — classic symptoms of hypothermia. The altitude is 6,000 feet and it's 10 degrees Fahrenheit, but he's not even wearing a jacket — just a hoodie, jeans and sneakers. One of his rescuers, Alessia Amendola, pours him some hot tea. "Immigrants are trying to go from Italy to France, illegally of course," she says. "We are in the mountains, where it's really dangerous." On average, she and other Red Cross volunteers rescue 15 migrants per night. But they have rescued as many as 40 in one night. Most are from sub-Saharan Africa. They've already risked their lives crossing the Mediterranean Sea from North Africa to Italy. Now they're trying to get out of Italy, which has made clear it doesn't want them. But this time, they're in an unfamiliar Alpine climate. "They don't even know what they are going to face," Amendola says. The Red Cross team picks up another migrant, delirious from the freezing cold. His eyes roll back as he collapses into their van. "Wake up! Wake up," says rescuer Michaela Macrì, as she slaps his cheeks. He too has hypothermia, and possibly frostbite on his hands and feet. For a moment, he wakes up and says his name — Seidu. He's from Senegal. He says he's 14. In this border region, an estimated 5,000 migrants have attempted to cross into France in 2018, according to local municipalities and aid groups. About half make it — local municipalities say more than 2,000 have crossed since last spring. But many don't. "We found several bodies of migrants this spring during the thaw," says Paolo Narcisi, a doctor and the president of Rainbow For Africa, an Italian nonprofit medical organization. "But some bodies we'll never recover. Because there are wild animals. Or the bodies decompose. If you don't know the way, it's easy to wind up off a cliff. And no one will ever find you." To understand why migrants are taking such deadly risks to leave Italy, look no further than the country's vice premier and interior minister, Matteo Salvini. In late November, his government passed a law that eliminates humanitarian grounds for granting asylum to people who are not fleeing political persecution or war. "You're not fleeing war. You're not escaping torture. What do you have to do? Go back to your country," Salvini said during an interview with Italian broadcaster RAI shortly after the law passed. "We already have 5 million Italians living in poverty. So I can't host hundreds of thousands of other people from the rest of the world." In 2017, roughly 130,000 people applied for asylum in Italy, second only to Germany in the European Union for the number of first-time applicants. Refugee status was granted to 6,827 people; about 27,000 others received other forms of protection. More than 119,000 migrants arrived in Italy by sea in 2017, according to the U.N. migration agency. Figures from the Italian interior ministry show a dramatic drop in 2018, with only 23,011 migrants and refugees arriving — a decline of more than 80 percent. Migrants started passing through the Alps to France even before the recent immigration law. After terrorist attacks in Paris in 2015, France reinstated border controls with Italy. That sparked a wave of migrants who sought to cross the border in temperate conditions near the Mediterranean coast. Starting last spring, French police cracked down on undocumented migrants crossing the border, prompting migrants to move to the Alpine north, where border controls are more difficult to enforce. The United Nations has blasted Italy's new law, warning it will violate human rights and fuel hate, as well as make it harder for migrants to access shelters. It's feared that thousands will wind up living on the streets. Harouna Waija (left) and Abdul Razak, both 22 and from Ghana, walk in the Italian Alps, near the French border. Two migrants who are living on Italy's streets are Abdul Razak and Harouna Waija, both 22 years old and from Ghana. Razak left because of poverty, he says; Waija because he converted from Islam to Christianity. His family wanted to kill him as a result, he says. In a train station near the French border in December, they are suiting up to cross the Alps. It is the first time they've seen snow. What looks like a second pair of jeans is coming out the ankles of Waija's pants. "It's five," he says. He's wearing five pairs of pants. Razak says he understands the risks and has nothing to lose. They've been sleeping on the streets after failing to gain asylum in Italy. The mountains can't be much worse, he reasons. "I'm worried, but I have to try," he says. "I want a better life." The two agree to let me follow along, and are joined by four other French-speaking migrants. The odd car whizzes by on the nearby highway as snow crunches beneath their feet. It's pitch-dark outside — easier to evade detection, but also easier to get lost. A passerby pulls over and points them toward the border. Soon, they're in the woods, just a few feet from a border post flying the French flag — and French gendarmes patrolling the frontier. Whispers of "la police" ripple through the group. If they get any closer, they risk being caught. They change course again, and decide to take their chances deeper in the woods. To the left, there's a ravine they want to cross. The other side is completely covered in trees they can use for cover. I walk with them for about 200 yards, until the snow starts coming up to my knees. I hear water running nearby, and worry about falling blindly into an icy river. I say goodbye and turn back, and the six migrants disappear into the darkness. The next morning, I get a call from Abdul Razak. He tells me he made it across the border to France. But after four hours of wandering in the snow, he was caught by French gendarmes and sent back to Italy. Harouna Waija wound up in an Italian hospital, where a nurse says he was treated for exposure. After a few hours on an IV drip, he'll be okay. "Yesterday the cold was freezing me," he says, with an audible shiver still in his voice. "My blood was frozen. It was very difficult." Going through the icy Alps, he says, is "not a good way. I'm regret." For now, the two are resigned to staying in Italy. Once spring comes and the snow melts, that's another story, they say. The seasons will change. Italy's crackdown on migrants might not. Follow Christopher Livesay on Twitter @clivesay.